Jewelry is one of the oldest forms of adornment, and it’s been used for centuries as a representation of faith. Many denominations have a trademark symbol or two, and they are often used in specific designs and settings. From simple metals to precious diamonds and stones, there is no shortage of options regardless of your beliefs. These are some of the most popular ways that people use jewelry to symbolize their religious affiliation. One of the world’s most common religions is typically represented by two main icons. The cross, which is derivative of the passion and death of Jesus Christ, is often used as the focal point in many pieces of jewelry. Typically, it’s worn as a pendant or charm but the simple symbol can be easily worn on rings, earrings, or cufflinks. A popular variation of the standard cross is the Celtic Cross. Because of its history and geographical origin, it is often used to represent the Catholic faith. However, across all denominations, it universally symbolizes the sacrifice and salvation of Jesus Christ. The Celtic Cross also usually maintains some elements of ancient pagan influence. The ichthys is a more specific symbol that isn’t as widely recognized as the cross, but its religious significance is similar. The Ichthys has a history as a secret symbol, and it’s still used for its subtlety today. This icon is particularly appropriate for a linked tennis bracelet or stud earrings. 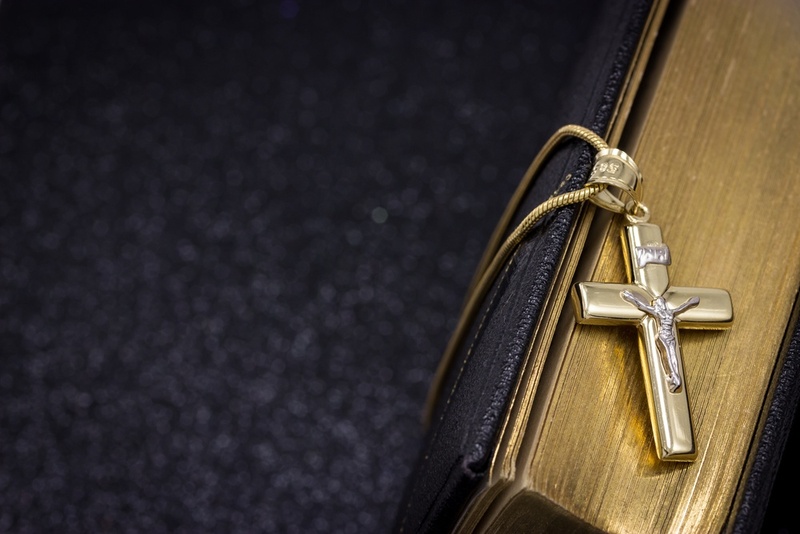 Catholicism is a branch of Christianity, but when it comes to religious jewelry there is one symbol that this denomination uses almost exclusively. The crucifix also symbolizes the passion and sacrifice of the religion’s main figure, but in a more somber and direct way by including the image of Jesus on the cross. The crucifix is typically worn as a pendant on a necklace or rosary. One of the most notable symbols of the Muslim religion is a star floating inside a crescent moon. But, there are a variety of other common icons that are used in jewelry. Calligraphy is a popular choice because of its connection to the Qur’an. The word Allah as well as the Ayat al Kursi prayer are standard designs, and the font alone is often used as the pendant, charm, or cornerstone of a piece. Many times, the font is either inscribed on a smooth metal background or the print is left as a cutout. Bracelets, necklaces, and anklets are typical types of jewelry used for these symbols. In the Buddhist faith, the dharmachakra represents Gautama Buddha’s teaching and walking of the path to enlightenment. Also known as the dharma wheel, this symbol is usually gold in color and it can include details in the center such as a yin-yang or secondary wheel. The number of spokes on the wheel can change its meaning, but the eight-spoke version is the most common option. A wheel with eight spokes derives from the Eightfold Path. For members of this faith, the dharmachakra is a highly personalized symbol, which makes it ideal as a wearable element. Many followers also opt to wear an image of Buddha as jewelry, usually in the form of a pendant or bracelet charm. In many cases, people choose to wear pieces that show his entire body as a form of respect and reflection for his importance in the religion’s discourse. One of the most well-known symbols of Hinduism is the Om. This represents what is considered to be the religion’s most sacred mantra, and it is a combination of all sounds that are used in human language. In jewelry, people often wear the word written in Devanagari script. Because of its shape and simple design, it’s perfect for small pieces such as rings and stud earrings. However, like many other religious symbols, it’s often worn as a necklace. This type of character goes especially well with coin-shaped pendants and minimalistic chains. The Khanda symbol is made up of four main elements that represent the creative power of God, balance, political sovereignty, and spiritual sovereignty. It has a deeply powerful role in the Sikh religion, and it serves to remind believers about the fundamental tenets of their faith. Specifically, it represents the Deg Tegh Fateh doctrine. The Khanda a bold and striking icon that lends itself well to men’s jewelry, such as tie clips and cufflinks. The Star of David, or Magen David, is a quintessential symbol of Judaism has a long history of solemnity, pride, and solidarity. 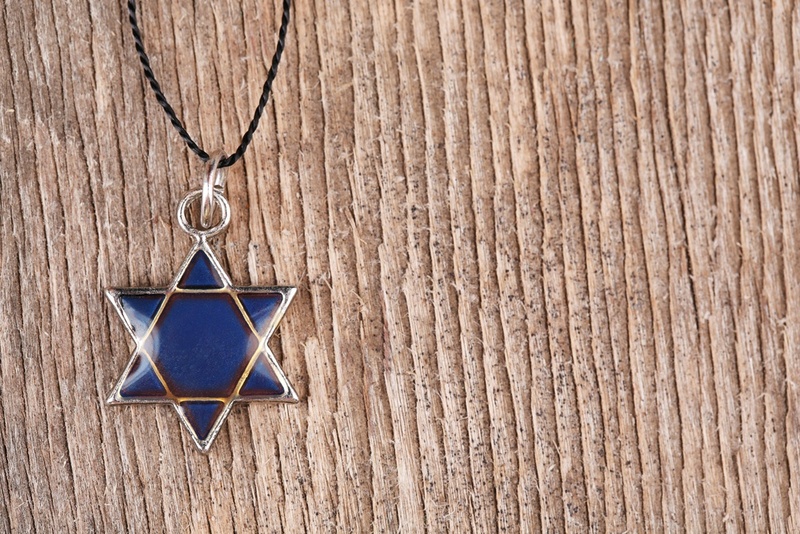 While there are a variety of reasons why someone would choose to wear it, it’s used worldwide as a notable but discreet way to display one’s position as a member of the Jewish faith. Like many other types of religious insignia, it can be worn by both men and women and it’s usually simple in design. In many cases, the star is also paired with the Shema or Chai prayers in Hebrew script. However, the most popular style is a small star pendant paired with a simple chain. The yin-yang is used as a symbol of peace and serenity for many different belief systems, as well as a general representation of Chinese culture. But, it specifically symbolizes a fundamental part of Taoism: opposition is required for harmony to exist. Since Taoism stresses the importance of living a simple, honest life that fosters harmony with nature and other beings. This black and white icon serves as a reminder of this ideology, and can be worn on just about any kind of jewelry or adornment. From toe rings to headpieces, it’s a popular icon for both believers and non-believers around the globe. It can be as simple or as fancy as you like, with white metals and both black and white diamonds being popular choices. The Bahá’í religion has many symbols, but the five-pointed star is most commonly used as a decorative element and it’s the official icon for this faith. This symbol is based on the human body with one head, two arms, and two legs. It’s also called a haykal, or temple. Bahá’í isn’t the only religion to use the five-pointed star, but it does have a particularly different significance for each individual belief system. Believers of this faith often wear this symbol in the form of a ring or pendant, with popular colors being gold, blue, and silver. Many people show their faith in their respective religions by wearing certain icons as jewelry. But, the type and reasoning behind each piece varies greatly from person to person. Whether you’re wearing one as a personal reminder or as a display of pride, there are an unlimited number of ways to symbolize your religion with jewelry.